When it comes to preserving peace around the world, the world counts on the U.S. military. And since World War II, the U.S. military has counted on us to provide the tough and dependable power connectors that keep its modern-day and off-road vehicles at their peak. Whether you’re an off-road OEM, after-market supplier, or a contractor to the military, we have the right parts for you. And if yours is a custom need, we’ll tool, produce and deliver the exact part you need, just as we did when Desert Storm mobilization required a rapid response. We are the sole supplier of “Water Seal” terminal lugs that provide extreme corrosion resistance – a part used on every tank, jeep and truck made since Vietnam. Our parts have served the U.S. Tank Automotive Command (TACOM) since the early 1950s. 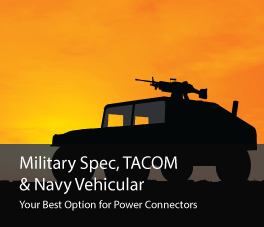 We routinely produce the key Army-Navy terminal spec MS20659 – we’re the oldest provider still offering this product – as well as a full line of hard-to-find “MS” (Military Spec) connectors. Download our 2,500-part catalog to see it all. And if you’re not sure what you need, our easy-to-use product configurator can ensure you find the right part, no matter your application.